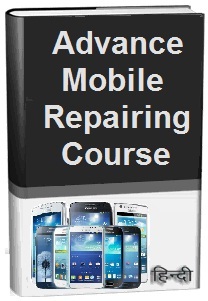 Mobile phone repair training course online free in Hindi me aaj ke lesson me aap sikhenge ki mobile phone ki pcb per Coupler ki pahchan kaise kare. Iske karya or khrabiya kya hai. Mobile phone ki pcb per coupler small type ka part hota hai. Basically yah network section me laga mil jata hai. Mobile phone repairing Hindi me aaj aap coupler ki phone ki motherboard per identify krna sikhenge. Mobile cell phone ki pcb per mainly 2 sections hote hai: Network Section or Power Section. Adhiktar mobile handsets me network section power section se uper bana hota hai. To chaliye shuru krte hai network section me coupler ki pahcan kaise kare. Mobile phone ki pcb circuit board per yah network section me laga hota hai. Yah black ya white dono me se kisi ek colour ka hota hai. Jiske dono side me 6 pins mudi hui lagi hoti hai. Yah electronic component only network section me hi lagta hai. Yah network filter krne ka karya krta hai. Coupler ke faulty hone per mobile phone me ‘NO Network’ ki problems aati hai. 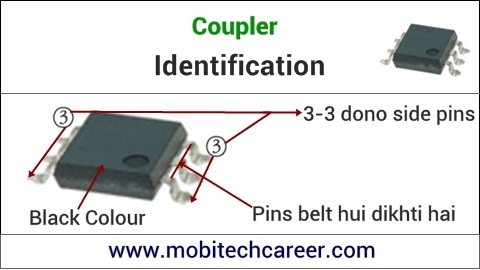 Mobile phone ki pcb per aap khud uper batayi coupler ki identification ke anusar iski khoj kare. Yah pcb per sabse uper lagi IC ke aas-pas laga hota hai. Kya Aap Jante Hai ? Mobile phone pcb board per Coupler or Network crystal dono ke faulty hone per cell phone me same problem ‘no network’ aati hai. Yah dono hi small parts motherboard per network section me lage hote hai. Network problems mobile me network section me kisi part ke faulty aane per hoti hai. Mobile phone repairing course in hindi me online sikhte rahiye, mobile repair krna sikhkar rojgar pane ka apna dream pura kare. Continue sikhte rahiye zara smile ke sath, kabhi bhi, kahi bhi.